CAVE-IN-ROCK, IL and LOS ANGELES, CA – AUGUST 10, 2012 – Speaking to their fans and media on the site of their 13th annual "Gathering of the Juggalos" music festival, the Insane Clown Posse expressed concern for the well-being of their fan base, which was labeled a "gang" by The Federal Bureau of Investigation's National Gang Intelligence Center's 2011 National Gang Threat Assessment. To that end, the duo of Violent J (Joseph Bruce) and Shaggy 2 Dope (Joseph Utsler) announced that they, along with Psychopathic Records, have retained legal counsel to investigate and pursue legal action including monetary compensation and/or other injunctive relief on behalf of their fan base, the Juggalos. If it seems odd that there will (hopefully) soon be a case captioned Violent J and Shaggy 2 Dope, et al. 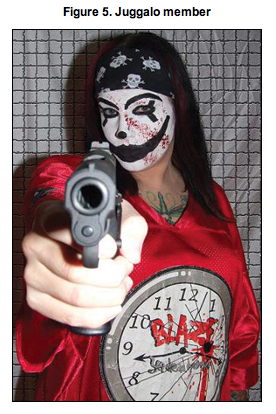 v. Federal Bureau of Investigation, or maybe just In re Juggalos, it seems less odd to me than the FBI's classification of the "Juggalos" (a term used to refer to fans of Insane Clown Posse) as a "loosely-organized hybrid gang." Even more disturbing than the FBI's use of a hyphen after an adverb is its apparent belief that all Juggalos are criminals just because some criminals may also be Juggalos. I first reported on this trend last year after police in Oklahoma initially blamed a hit-and-run on a "Juggalo" just because the alleged perpetrator was wearing clown makeup. See "Suspect's Juggalo Status Unclear, Say Juggalo Experts," Lowering the Bar (May 31, 2011). To his credit, the local police chief later came to the group's defense, saying "We know our Juggalos here. They've always been law-abiding." For some reason, the FBI can't make the same distinction. Most crimes committed by Juggalos are sporadic, disorganized, individualistic, and often involve simple assault, personal drug use and possession, petty theft, and vandalism. However, open source reporting suggests that a small number of Juggalos are forming more organized subsets and engaging in more gang-like criminal activity, such as felony assaults, thefts, robberies, and drug sales. Again, even more disturbing than its failure to hyphenate "open-source reporting" is its apparent classification of an entire group (of music fans!) as a "gang" based on, well, open-source reporting "suggesting" that a "small number" of people who happen to be members of that group are acting "more gang-like." C'mon, FBI. I have no doubt that there are Juggalos who are criminals and criminals who are Juggalos (are we really having this conversation? I guess so), and maybe even actual gangs who call themselves "the Juggalos," but to label a whole group of music fans as potentially criminal for that reason is nothing but guilt by association. Are you now or have you ever been a Juggalo? "We are seeking individual Juggalos whose rights have been violated as a result of the mistaken belief that they are a 'gang member.' If you or someone you know has suffered any negative consequence with an employer, governmental representative, including law enforcement, border patrol, airline security, or other local, state or federal governmental agency or employee as a result of your status as a Juggalo, we want to know about it." Juggalos who have experienced such discrimination, and so may be potential class representatives, are asked to fill out the "Juggalo Legal Action Questionnaire," which can be found at www.juggalosfightback.com.